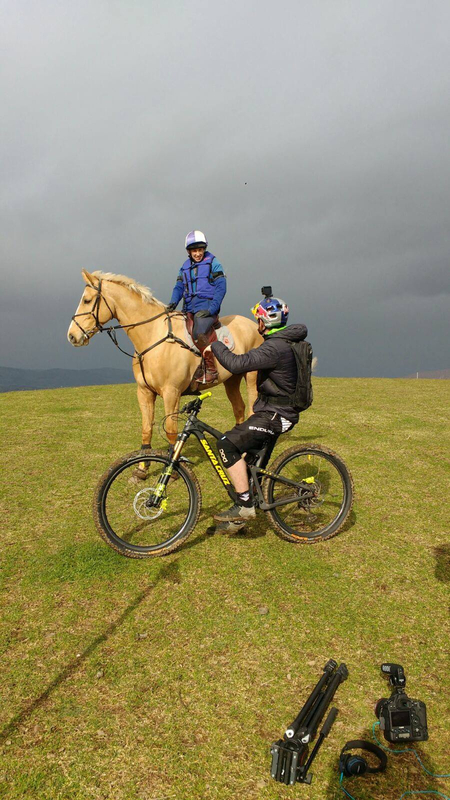 Top event rider Louisa Milne Home recently took on renowned British mountain biker Danny MacAskill in a challenge to see whether horse power could beat pedal power. The pair tackled the cross-country course at Lindores, Fife, Scotland. Lindores Cross Country was established in 1989 and has expanded heavily in the last few years, now operating as a full equestrian training centre. After trying out a few stunts, the pair took part in a race. Jumps included pheasant feeders, whisky barrels, steps and cottages, finishing at a fence inspired by Danny himself – a six metre high keyhole fence, dubbed the Danny MacAskill Hay Bale. Louisa’s horse, Future Plans (aka Jack, or ‘the Golden Wonder’) is a stunning palomino 17hh Irish bred intermediate eventer and took on the challenge like a pro. Louisa has competed at various events such as Land Rover horse trials, Burgham International and most recently Allerton Park. She has high hopes for Future Plans in the coming years. The biker is from the Isle of Skye, Scotland and soared to fame via a YouTube video in 2009. Since then he has produced numerous viral clips. Whether they plan to become regular training buddies remains to be seen, though it looks like they had a lot of fun. Watch Louisa and Danny in action here.